This map, a screenshot from The Opportunity Atlas, shows household income in 2014-2015 for people born between 1978 and 1983 to low-income parents. In areas that are more red, people who grew up in low-income households tended to stay low-income. In areas that are more blue, people who grew up in low-income households tend to make more money. 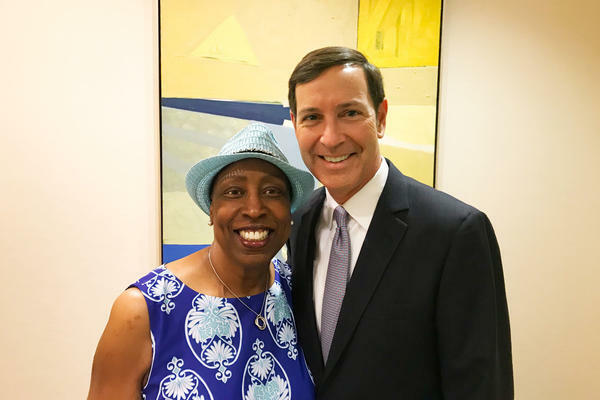 Dr. Ophelia Garmon-Brown (left) and Dee O'Dell co-chaired a task force that identified early childhood development, social connections and family stability as key factors in enhancing upward mobility in Charlotte. This map, a screenshot from The Opportunity Atlas, shows household income in 2014-2015 for African-Americans born between 1978 and 1983 to low-income parents. Sedgefield Middle School is in a part of Charlotte where blacks who grew up in low-income households tended to stay low-income. Eric Tornfelt, Assistant Principal at Sedgefield Middle School. The school is located in a majority white neighborhood not far from downtown Charlotte, but the school's population doesn't reflect the neighborhood. 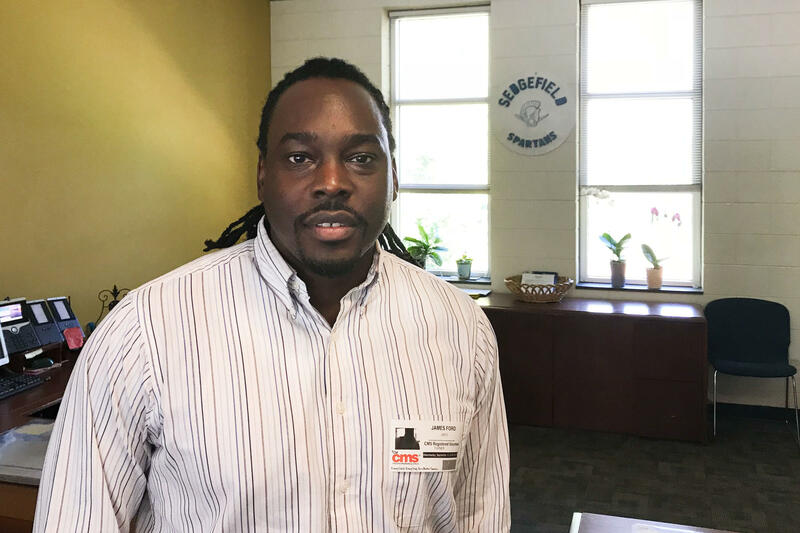 James E. Ford, a former North Carolina teacher of the year, is working with Sedgefield Middle School's administration to make the school more racially balanced. Chetty and his colleagues worked with the Census Bureau's Sonya Porter and Maggie Jones to create the The Opportunity Atlas, which is available to the public starting Monday. At first glance, it looks a lot like a Google map, where users can see the whole country, or zoom in to local neighborhoods. The difference is in the amount of data that pops up when a neighborhood is highlighted. Researchers hope this data will help communities understand and tackle the barriers that prevent people from climbing the economic ladder. They want policymakers to use this data to offer new solutions locally. Chetty explains that the government data they are working with is kept anonymous. The information can help pinpoint the places where lots of kids are climbing the income ladder and "the places where the outcomes don't look as good," he says. Chetty found that if a person moves out of a neighborhood with worse prospects into to a neighborhood with better outlooks, that move increases lifetime earnings for low-income children by an average $200,000. Of course, moving a lot of people is impractical, so researchers are instead trying to help low-performing areas improve. Charlotte, N.C., has gotten a head start on this effort. The city has enjoyed strong economic growth over the past couple of decades and many people assumed the progress had been shared across the city. But in 2014, Chetty and his colleagues released data showing that Charlotte was dead last out of 50 cities at providing upward mobility for low-income kids. Dr. Ophelia Garmon-Brown, a prominent Charlotte resident, wasn't surprised the city had done poorly. "I've been a physician for a lot of years, worked with people who live in poverty, so I saw it," she says. But Garmon-Brown says she was among those who were shocked that Charlotte had come in dead last. The news came as a loud wake-up call. And Charlotte responded, Garmon-Brown says. She was drafted to co-chair a task force, formed by the Foundation For The Carolinas, to develop a plan to attack the problem. The task force's report identified early childhood development, college and career readiness, family stability and strong social networks as key factors that enhance upward mobility. It singled out segregation as a key obstacle. And now, Charlotte officials are learning to use the Opportunity Atlas to effectively target some remedies, things like pre-K programs and affordable housing. Frank Barnes, the chief equity officer for Charlotte-Mecklenburg Schools, says the Opportunity Atlas will be very helpful in shaping future decisions. "The Foundation for the Carolinas have brought a lot of partners to the table to think about how to act on these data and I think that's the power; it's in the community collaboration and the community partnership," he says. The future is already taking shape at Sedgefield Middle School. It's located in a majority white neighborhood not far from downtown Charlotte, but the school's population doesn't reflect the neighborhood. 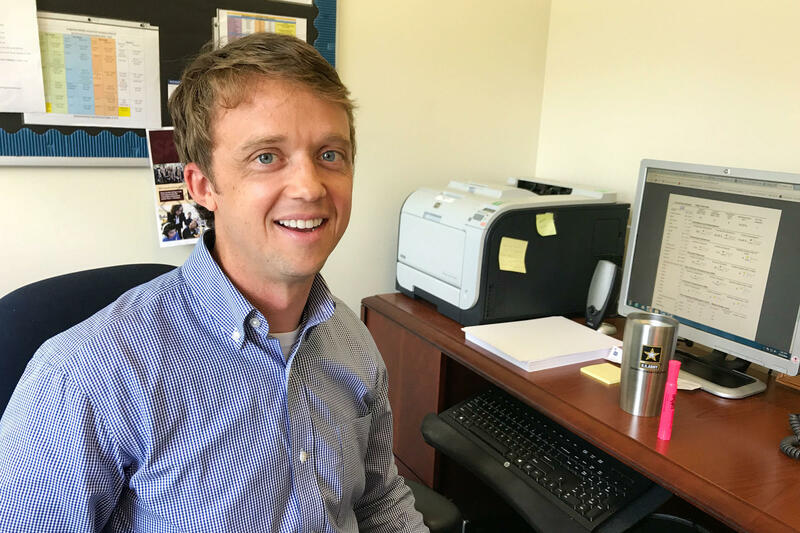 Assistant Principal Eric Tornfelt, says only 4 percent of the school's student body is white; the rest is almost evenly split between African-American and Hispanic students. Tornfelt acknowledges the school has challenges. "There is significant opportunity for growth," as he puts it. "We have some great kids." It's not unusual for a public school in Charlotte to have a student body that's largely people of color. That's because many white students attend private schools or public schools outside their neighborhoods. Those choices can hinder upward mobility for children who attend neighborhood public schools. James E. Ford, a former North Carolina teacher of the year, is working with Sedgefield's administration to make the school more racially balanced. Ford, now an education consultant, says two local elementary schools have already merged for that reason. "Eventually, something similar is going to happen here," he says. "The demographics here are going to shift quite a bit. It's majority black and brown now, but in the coming years it will change, it'll start to look more like the neighborhood." But there's another challenge here, beyond segregation — the lack of social networks minority children need to succeed. The Sedgefield neighborhood is more affluent than a nearby majority black neighborhood called Southside Park. But the Opportunity Atlas shows that African-American men who grew up in Sedgefield in the 1980s and '90s are doing worse now than their counterparts from Southside Park. The median income of African-American men in Sedgefield is $5,000 less per year than their neighbors in Southside Park. Ford says that might surprise people. "We may assume because the area is affluent, like, 'that's a high-opportunity area,' when the truth is that may not be a high-opportunity area, according to all the metrics that we're looking at," he says. In this case it may be that the majority black neighborhood of Southside Park offers young black men the social networks, friends, extended family and churches that help them get ahead. Those kinds of networks might not be accessible to them in a majority white neighborhood. Ford says the Opportunity Atlas should help reduce misconceptions about economic mobility. "So this permits us to start making really smart and really intentional decisions so that, 20 to 30 years down the line we can look and say, 'Yeah, that was the right call,' " he says. Charlotte is already taking significant steps in that direction. Mecklenburg County, which encompasses the city, has committed to providing pre-K for all children. And the city has a $50 million bond issue for affordable housing on the November ballot. Matching private donations could boost the total to over $100 million. Harvard's Chetty says he hopes the Opportunity Atlas will help communities across the country revive the American dream in their neighborhoods. "We hope citizens, local policymakers, nonprofits, people working on these decisions can use [the data tool] to make better decisions," he says. We'd like to think America is the land of equal opportunity. But that depends on exactly where in America you live. It's often said that you can predict the futures of many kids by finding out the zip code where they grew up. An online data tool being made public today lets you see for yourself the link between where you are and the American dream. Here's NPR's John Ydstie. RAJ CHETTY: You see that for kids turning 30 today who were born in the mid-1980s - only 50 percent of them go on to earn more than their parents did. That is, it's a coin flip as to whether you are now going to achieve the American dream. YDSTIE: Chetty and his colleagues at Opportunity Insights, a research and policy institute located at Harvard, want to improve those odds. So they've partnered with the U.S. Census Bureau to develop an online program. It works a lot like a Google map. You can see the whole country. Or you can zoom into local neighborhoods. And you can click on a neighborhood and get an immense amount of data from incomes and racial makeup to marriage figures. CHETTY: We are able to pinpoint, you know, what are the places where we're seeing lots of kids climbing the income ladder? What are the places where the outcomes don't look as good? And we've put this all out in the form of a publicly available, interactive tool called the Opportunity Atlas that we hope citizens, local policymakers, nonprofits, people working on these issues can use to make better decisions. YDSTIE: Chetty found that moving out of a neighborhood with poor upward mobility to a better one increases lifetime earnings for low-income kids by an average of $200,000. Of course, moving a lot of people is impractical. So the focus is on helping low-performing areas improve. Charlotte, N.C., has gotten a head start on this effort. Back in 2014, Chetty and his colleagues found Charlotte was dead-last out of 50 cities at providing upward mobility for low-income kids. That shocked many residents. OPHELIA GARMON-BROWN: If you know anything about Charlotte, Charlotte wants to be No. 1. YDSTIE: Ophelia Garmon-Brown, a prominent Charlotte physician, says that ranking ran counter to Charlotte's image of itself as a thriving banking center with an expanding high-tech sector and a city that's been a leader in job creation and wage growth over the past two decades. GARMON-BROWN: I wasn't surprised that we had done poorly. I've been a physician for a lot of years, worked with people who live in poverty. So I saw it. YDSTIE: What she saw was a segregated city where low-income black residents especially faced little chance of moving up the economic ladder. Garmon-Brown joined an effort by the Foundation for the Carolinas to address the problem. The group identified early childhood development, college and career readiness, family stability and strong social networks as key factors that enhance upward mobility. It singled out segregation as a key obstacle. And now Charlotte officials are learning to use the Opportunity Atlas to effectively target some remedies, things like pre-K programs and affordable housing. ALANNA WILLIAMS: So what I have up here right now is just kind of a pure map of median income in Charlotte. YDSTIE: Alanna Williams, from the Chetty team, is demonstrating the Opportunity Atlas for a group that includes local officials. She zooms into Charlotte and clicks on neighborhoods. 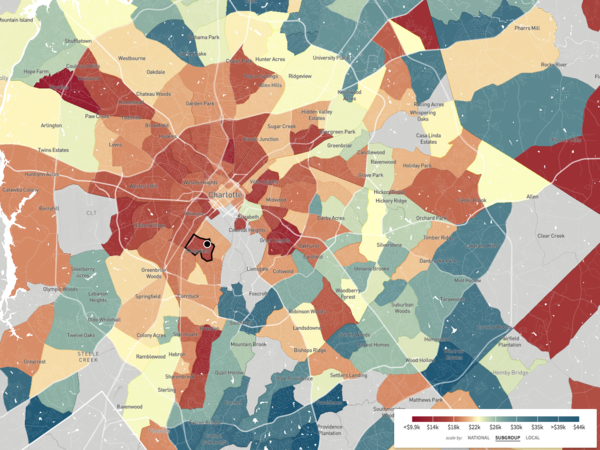 If the area is reddish-brown, it signals low levels of upward mobility. If it's green or blue, it has higher opportunities. WILLIAMS: So this is the outcomes for children who grew up in different tracks in Charlotte. YDSTIE: Frank Barnes is the chief equity officer for Charlotte-Mecklenburg schools. He says the tool has already exceeded his expectations. FRANK BARNES: I think the key thing that has happened is that the Foundation for the Carolinas have brought a lot of partners to the table to think about how to act on these data. And I think that's the power. It's in the community collaboration and the community partnership. YDSTIE: Charlotte's effort to improve upward mobility is already taking shape at Sedgefield Middle School. It's located in a majority-white neighborhood not far from downtown Charlotte. But Assistant Principal Eric Tornfelt says the school's students are mostly black and Hispanic. ERIC TORNFELT: So we got 48.9 percent are Hispanic - 44.5 percent are African-American. Four percent are white. YDSTIE: It's not unusual for a public school in Charlotte to have a student body that's largely minority. That's because many white students attend private schools or public schools outside their neighborhoods. That segregation hinders upward mobility. James E. Ford, a former North Carolina teacher of the year, is working with Sedgefield's administration to make the school more racially balanced. Ford, now an education consultant, says two local elementary schools have already merged for that reason. JAMES E. FORD: Eventually, something similar is going to happen here. The demographics here are going to shift quite a bit. It's majority-black and -brown now. But in the coming years, it'll change. It'll start to look more like the neighborhood. YDSTIE: But there's another challenge here beyond segregation. It's the lack of social networks minority children need to succeed. The Sedgefield neighborhood is more affluent than a nearby majority-black neighborhood called Southside Park. But the Opportunity Atlas shows African-American boys growing up in Sedgefield in the 1980s and '90s are now doing worse than their counterparts from Southside Park. Ford says that might surprise some people. FORD: We may assume because an area's affluent, like, that's a high-opportunity area. Well, the truth is that may not be a high-opportunity area, according to all the metrics that we're looking at. YDSTIE: In this case, it may be that the majority-black neighborhood of Southside Park offers young, black men the social networks, friends, extended family, churches that help them get ahead. Those kinds of networks might not be accessible to them in a majority-white neighborhood. Ford says the Opportunity Atlas should help reduce misconceptions about economic mobility. FORD: So this permits us to start making really smart and really intentional decisions so that 20, 30 years down the line, we can look and say, yeah, that was the right call. YDSTIE: Charlotte is already taking significant steps in that direction. Mecklenburg County, which encompasses Charlotte, has committed to providing pre-K for all children. The city of Charlotte has a $50 million bond issue for affordable housing on the November ballot. Raj Chetty says he hopes the Opportunity Atlas will help communities across the country revive the American dream in their local neighborhoods. John Ydstie, NPR News, Charlotte, N.C.
(SOUNDBITE OF EDO.G'S "SITUATIONS (INSTRUMENTAL)"
MARTIN: You can find the Opportunity Atlas at oppurtunityatlas.org. Transcript provided by NPR, Copyright NPR.